Comodo cWatch is a comprehensive continuous monitoring solution for internal and cloud network security that is tuned to detect threats before they can affect your servers, databases or critical infrastructure. 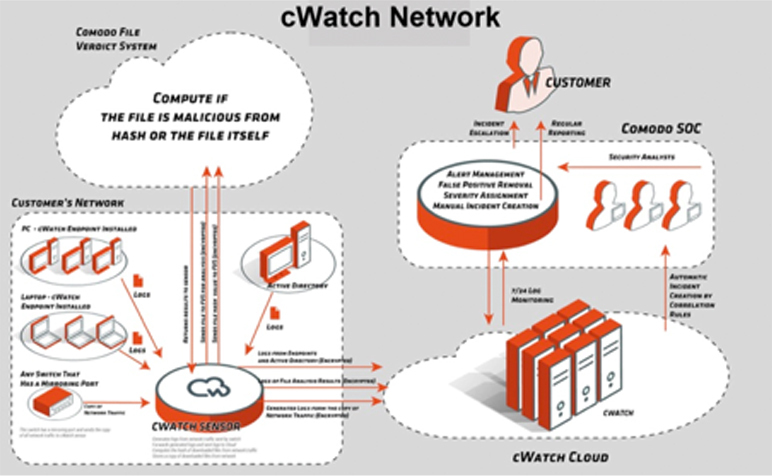 cWatch provides continuous monitoring and reporting of network, system, user activity and data access in combination with extensive analysis and correlation capabilities. 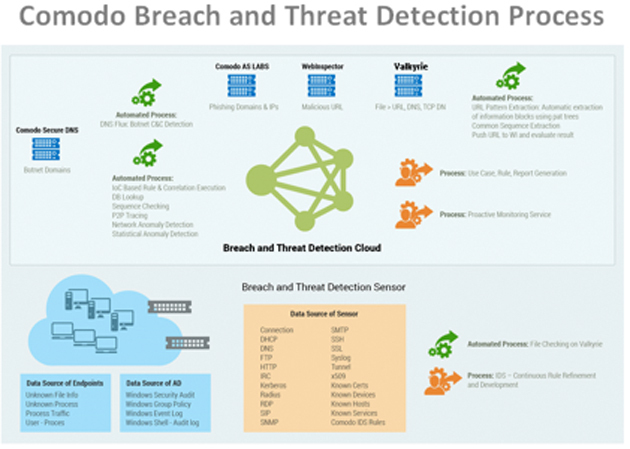 The Comodo breach and threat detection system follows a process to gather all data, including sources from the endpoint client network, and analyzes them against indicators of compromise (IOCs), using both data analysis and human analysis techniques. Simply by gathering logs from Advanced Endpoint Protection provides enterprises with extensive visibility over endpoints, files executed or in transit, the files' verdicts and relevant interactions. The Comodo Security Operation Center (CSOC) provides breach prevention and threat detection delivered as a managed service (SaaS). As part of the managed service delivery, the CSOC is responsible for the monitoring and assessment of any advanced threats that target enterprise network assets and cloud-deployed applications along with accompanying underlying cloud infrastructure. With the extensive threat intelligence about emerging malware and threats from the Comodo Global Threat Cloud, the CSOC provides an early warning and assessment of any malicious activity that target either of these environments. All of the services are managed by CSOC Centers in the US and EMEA. functions into one platform including network monitoring, application detection, full packet capture, intrusion detection, packet processing and protocol inspection. Real-time threat intelligence monitoring provides critical data on applications and infrastructure without affecting Network Performance. Visibility into the web server or application but also to any middleware applications, database access, configuration changes, server authentication, security logs, anomaly detection, incident response and alerting, as well as immediate protection from emerging threats by developing handcrafted security policies and signatures for your web site and applications.